An excellent model, well-priced and loaded with high-value therapeutic features. The Infinity Escape massage chair is recommended for chronic pain sufferers up to 6’5” in height. Not recommended for casual or hobbyist users. Are you a taller person who suffers from chronic pain? Have you been struggling to find a chair that will fit you and deliver a raft of therapeutic benefits without requiring you to take out a second mortgage? 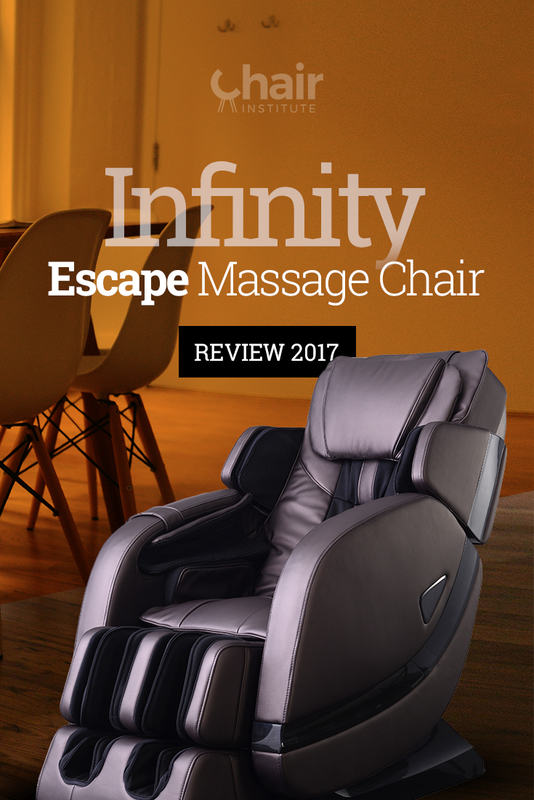 If you answered yes to either of those questions, then you’re going to love our review of the Infinity Escape massage chair. Depending on who you ask, it’s either at the high end of the value-priced segment of the market or at the low-end of the mid-range. Either way, it doesn’t cost an arm and a leg and is loaded with powerful features designed to relieve chronic pain. We’ll cover every feature the Escape has to offer in the sections below. In the end, we think you’ll agree – it’s an incredible value for the money! The Escape gets off to a strong start by utilizing a Hybrid massage track, in conjunction with quad rollers. The quad rollers are significant because of how closely they mimic the feeling of human hands. The Hybrid L/S Track is cutting edge massage chair technology. While you do find it in other chairs at this price range, it’s not so common. The key advantage of a Hybrid track is that it allows the massage rollers to track along the natural curve of the spine and continue down under the seat of the chair to also massage the glutes and the backs of the thighs. As a result, you get something much closer to a full body roller-based massage. As good as the combination of the Hybrid Track and quad rollers is, if those rollers aren’t hitting where you need them to, then the massage you get from the chair will be substandard. Infinity understands this, which is why they also incorporated 3D Body Scanning Technology. This allows the chair to take a scan of your back before your massage begins and make small adjustments to the position of the rollers, to ensure they hit the pressure points on your back. Most of the time, this works. However, every now and then, the tech can miss the mark. When that happens, there’s a fallback. The remote allows you to manually adjust both the roller positions and the width of the massage field, ensuring a perfect massage experience, every time you use the chair. The Infinity Escape massage chair offers one Zero-G seating position, available at the touch of a button. The reason Zero-G is such a popular feature is that it directly impacts the overall quality of your massage. By reclining you to a position such that your knees are elevated slightly above your heart, most of your body’s weight is pressing down against the rollers, resulting in a deeper, more penetrating massage. This provides tremendous synergy with the rollers, which already deliver a deep tissue experience, and offers maximum therapeutic benefit. Our one gripe with the implementation of this feature is the fact that there’s only one Zero-G seating position offered. Nowadays, it is quite common to see two, or even three different positions. Since more options are always better, we’d’ love to have seen that here. Nonetheless, the fact that Zero-G seating is offered at all has to be counted as a win for both the design and anyone who purchases the chair. That’s an impressive number! With so many pre-programmed options available, even people who aren’t especially tech-savvy will have no difficulty using the chair. As impressive as all of that is, there is one curious limitation to make a note of. This is a deep tissue massage chair, designed for therapeutic use. As such, while you can modify the speed of the rollers via four different levels from the remote, there’s no means of adjusting the massage intensity. Opinions are divided on this point, but we see it as a design weakness. Supporters say that since the chair is intended for therapeutic use, there’s little need to offer an intensity adjustment. This is mainly because chronic pain sufferers tend to want the strongest massage they can get. While that’s true, it’s also true that most massage chairs are used by more than one person in practice. If that’s the case in your home, then those who don’t suffer from chronic pain may find this chair to be too intense for them to use. This is the reason why we don’t recommend it for casual or hobbyist users. We feel that the chair would appeal to a much broader segment of the market if it offered some intensity adjustment. Utilizing 38 Second Generation Airbags and featuring four levels of intensity control, the Escape’s air massage is on par with, or slightly superior to other massage chairs the model competes with. Not only does this allow you to further fine-tune your massage experience, but it also expands the massage combinations the chair can do. An excellent feature implementation! ​By combining deep tissue massage with lumbar heat, the ﻿Escape offers tremendous therapeutic benefit to those who suffer from chronic lower back pain, because the heat helps to loosen those tight muscles, making the pain vanish like magic. ​The only real shortcoming of the implementation of this feature is the fact that there’s no precise temperature control. Nevertheless, that’s true of just about every massage chair in the Escape’s price range. Aside from the body stretch feature (discussed next), this will probably become your favorite. Our Infinity Escape massage chair review would not be complete if we didn’t call particular attention to this feature. Basically, it is the most powerful therapeutic benefit the model has to offer. It provides almost immediate pain relief for those who suffer from chronic back pain. It accomplishes this by gently but firmly stretching your body to take pressure off of compressed discs in your spine, which are the leading cause of back pain. Apparently, it offers the same benefits as a chiropractic adjustment, with the added advantage that it’s available anytime you need it from the comforts of your home. Note that the b﻿﻿﻿ody str﻿﻿etch feature, while superbly implemented, is quite robust. So if you suffer from acute pain, it may be more than you can handle without some warm up. If it’s too intense, try starting with a massage routine combined with the heat function, which will help loosen your muscles in advance of the stretch. Since more than half of the chair’s airbags are located in the leg massage ports, the calf and foot massage is excellent. The calf massage is rendered entirely by airbags, while the foot massage utilizes a combination of air and foot rollers to attend to the soles of the feet. Most chairs that offer a roller-based﻿﻿﻿﻿ foot massage use a simple dual-roller system. The Escape goes the extra mile by using a tri-roller system (It has six rollers total, three in each footwell). The result is an exquisite experience that is better than just about every other chair the Escape competes with. If you suffer from chronic leg and foot pain, you’ll find yourself using this feature almost constantly. This is a small-but-powerful feature we were pleased to see incorporated into the design. The spot function allows you to interrupt whatever massage program you’re currently running and have the rollers focus on an area six inches in diameter from where you pressed the button. This allows you to pay extra attention to the particularly sore spots on your back, which is tremendously helpful to people who suffer from chronic pain in highly localized areas. To exit spot massage, simply press the button again. Your previous massage program continues where it left off. All of Escape’s massage options default to twenty minutes, but can be adjusted to either ten or thirty minutes. This isn’t as good as fine-grained control that allows you to precisely set the massage duration, but it's pretty good. We count this as an average feature implementation. This is a small-but-critical feature in our view because its presence allows the chair to accommodate users up to 6’5” in height. Taller users don’t have nearly the massage chair selection that shorter users do. That limitation is keenly felt in the subset of therapeutic chairs. Fortunately, the Escape is an exception to this rule. It's one of the few truly therapeutic models designed with taller users in mind that deserves a special nod of recognition. Even though the Escape offers a robust feature set, the remote is quite simple to operate. All the buttons are logically placed. You’ll have no trouble navigating to the features you want. You’ll be able to sit down and start enjoying your first massage in a matter of minutes, and will master the chair not long after. A job very well done by the folks at Infinity! Honestly, for a chair in its price range, there’s not much to complain about. Sure, there are some things the chair can’t do. However, the things we could write about here would also be true of every other chair in its price range. More Fine-Grained Timer Controls. Hand in hand with this, we’d also love to see the massage durations default to the industry standard of thirty minutes. Addition of Calf Heat to increase the therapeutic value to people who suffer from chronic pain in their lower extremities. These feature suggestions are built on the things that the chair already does. In our view, these would simply make the design more robust. Even considering the absence of the things we mentioned in the last section, this is a superb massage chair. If you’re a taller person, and if you suffer from any sort of chronic pain, the Infinity Escape will help make you feel better. Infinity Escape Massage Chair User Manual. Infinity Escape Massage Chair Quick Start Guide. Massage Therapy Styles and Health Benefits, WebMD. Deep Tissue Massage Explained, Very Well.